School Fab Lab Virtual Reality makes it possible for anyone to experience a digital fabrication laboratory from anywhere, using virtual reality! The School Fab Lab Virtual Reality App (SFL VR App) will shortly be available from the STEAM market for the HTC Vive. To receive updates, register HERE. Immersed in the Fabrication Laboratory (Fab Lab), you interact with machines, learning how to use them and what can be created. It replicates an environment simulating a physical presence where you can delve into different stations and learn about various digital fabrication processes. 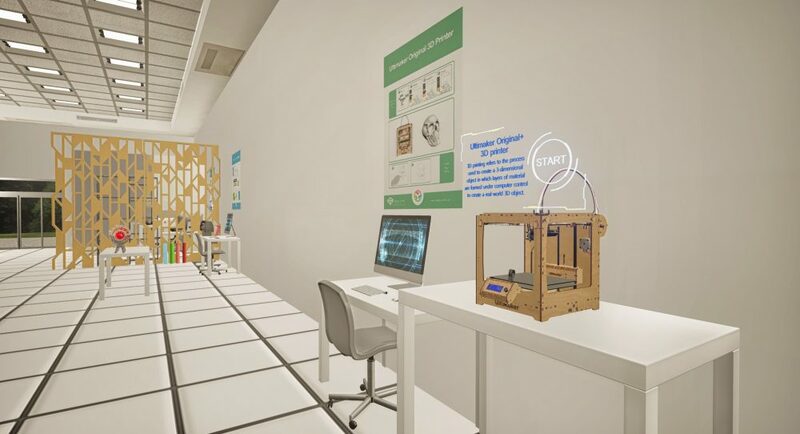 Intended to reach any student, K-12 school, or educational institution, SFL VR provides knowledge and training on digital fabrication without requiring physical access to the machines or space. For example, students can build 3D printers, or learn how to fly drones. Watch this video to see the virtual reality process. In the case of the Ultimaker 3D printer, the newly created SFL VR App allows a virtual hand to select the “Disassemble” button – and then the Ultimaker pieces separate into mid-air. The hand presses “Assemble” and the pieces float back into shape as before. The machines in the SFL VR App are just like the ones found in the physical School Fab Lab Makerspaces built at St. Joseph High School and Fontbonne Hall Academy, both in Brooklyn, New York. Students there are able to use the actual 3D printers to create items, of course – but the VR version takes things one step further. Students can see the machine from the inside out… Perhaps learn how to assemble a real one for themselves… And certainly, they might gain the knowledge and courage to make more complicated items in reality. Learn more about the School Fab Lab Makerspace and register to get updates on the SFL VR App HERE.